One of the reasons why Uflex is at the Helm while its Founder, Chairman & Managing Director Mr. Ashok Chaturvedi revered as the Father of the Indian Flexible Packaging Industry is the fact that the concept of sachet packs in India was introduced by him back in the mid-eighties. It was for these sachet packs that the expensive FMCG brands for ketchups, shampoos, mouth fresheners etc. suddenly came within the reach of the masses changing the very way these products were marketed. A lot of water has flown under the bridge ever since! With cutting edge technology and some of the best brains by its side Uflex over the years has evolved to become India’s largest multinational flexible packaging materials and Solution Company. The sachets though small in size have packed quite a punch on several international platforms. 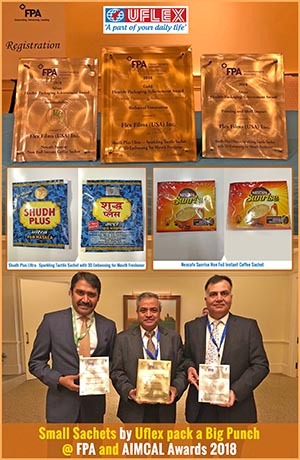 Nescafe Sunrise Non-Foil Instant Coffee Sachet has been conferred with the Silver Award 2018 for Sustainability by Flexible Packaging Association. This year, 66 package entries were received by Flexible Packaging Association with a total of 164 entries (some packages were entered into multiple categories). Twenty packages were honoured with 31 Achievement Awards. Shudh Plus Ultra ushers into a whole new era of Technical Innovation due to its tactile printing. This printing innovation of depositing high strength solids on to flexible packaging substrates provides aesthetically superior packaging options. Also, this packaging development opens the world of new possibilities in creating packs which could be offered for the visually impaired market with Braille printing through tactile functionalities. Mouth Freshener market category is inundated with several me-too brands and the Point-of-Sale (POS) impact infused through packaging re-production and design elements drive the impulsive purchasing behaviour. Shudh Plus Ultra Mouth Freshener artwork was handed over to Uflex with a one line objective of creating a never seen before design. The team at Uflex brainstormed about the design elements and came up with print reproduction having a combination of (1) Tactile effect; (2) Glitter Effect; (3) Embossing Effect on the brand and (4) Provide a combination of Gold and Silver anti-counterfeiting 3D embossed effect bearing the logo of the client. All these critical parameters have been achieved with a combination of rotogravure, flexography, and electron beam coating using a surface printed registered application on paper and also entailing hot foil stamping. Surface printing of the base design was done on coated paper using a combination of rotogravure and flexographic print transfer technologies. A special laser engraved cylinder with specially developed engraving cell configuration was used to transfer the higher solid content and glitter pigment on the surface. The printed substrate was processed through electron beam coating line in register to create the embossed effect on the brand name. The final processing entailed the transfer of 3D embossed effect of the logo using a special purpose machine utilizing hot foil stamping. The speciality of this job was to provide one side gold and another side silver embossed effect to deter counterfeits as this is the first of its kind job where a combination of different metal reproductions have been done simultaneously. The uniqueness of design is that the printing has been done using high solid content ink imparting the superior tactile effect with a combination of glitter enhancing the shelf impact catching the attention of the customer at the already inundated Point-of-Sale (POS). One can visualize the shimmering effect on the string of mouth-freshener packs hung at the POS. Nescafe Sunrise Non Foil Instant Coffee Sachet is a portion controlled unit pack of a unique blend of coffee chicory mixture. Instant coffee chicory mixture is extremely hygroscopic and has always been packed in flexible packaging where aluminium foil provides the functional barrier. In order to eliminate the use of aluminium foil to provide a sustainable packaging solution, engineers at Uflex Limited worked on high barrier metallized polyester film which could effectively replace aluminium foil. The new packaging development for replacement of Aluminium foil has been extensively tested with similar shelf life of 12 months (as offered by the erstwhile packaging) for this new packaging. Consumers are able to get the same product delivery with lesser packaging material and are able to simply tear, dispense and consume the product in entirety. The new packaging consists of 10 micron polyester (reverse printed) and is laminated with 12 micron high barrier metallized polyester and 20 micron polyethylene using a tandem extrusion lamination process. Nescafe Sunrise Non Foil Instant Coffee Sachet development has resulted in a 45% weight reduction in replacement of Aluminium Foil with Metallized Polyester. This significantly reduces carbon footprint (emission of GHG) through all the three critical phases of the packaging product i.e. manufacturing, transportation and disposal. With millions of such sachets in retail circulation, one can imagine the quantum of aluminium replaced by relatively lighter polyester substrate thereby justifying the raison d'être of flexible packaging.